From the stylish and courtly competitions of old Japan to the vital and evolving independent game development scene. 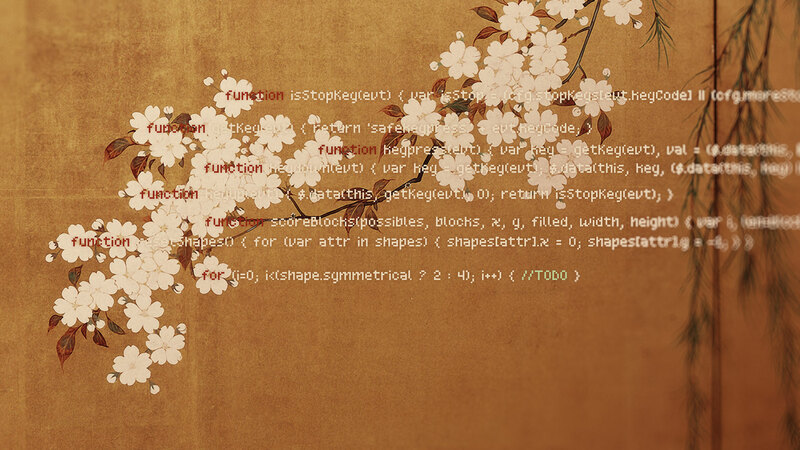 If code is poetry, then gaming is a poetry contest—which was in itself a game, in medieval Japan. Imagine yourself in a noble court, having to show off your skill with language, puns and coded messages, where all your turns of phrase, all your politics, gossip and flirting had to fit in strict structures. The structure never changes, but different poets have their own specialties, styles and sets of knowledge they bring to the show. In medieval Japan—particularly in the Heian period (794 to 1185 AD)— this is what people did with poetry. A poem about the sunrise could really mean you missed your lover. A poem about pine trees could mean longing for a past crush, or memories of your childhood home. Poetry was popular then among the elite, partly because it showed how sophisticated you were—and how skilled you were in creating coded messages and puns. It was a way to show off your knowledge and impress your peers, and it was a game in its own right. One of these games was called renga, which basically means "linked verse". A group of people would gather in the evening when it was cooler; one person would start off the poem with the first three lines, in strict 5-7-5 syllable format, and another person would use those three lines to come up with another set (this time of two lines of 7 syllables each). They used syllable counts instead of rhyming as it was more challenging, because of the way the Japanese language works. In this way, linked chains of poems could be made, with the challenge coming out of “jumping” from one set of images to the next and making it all seem coherent in some way. This emphasis on strict format is a bit like computer programming, in which commands and their permutations can be arranged to make the computer calculate something you want. In the end, manipulating the form is what causes art to emerge from what would otherwise just be bunches of calculations. Like computer programming, renga can be difficult to translate into ordinary English, however; it has its own codes, its own practices, its own language. In fact, code poems have been a project of developers and programmers for a while (see this article about code poetry in Wired). Renga, however, adds another layer of complexity to the idea of code as poetry. Since renga is linked verse, and by nature requires collaboration, it can be similar to working on a game, especially with regard to larger games that require a team: you have a team of people working within strict formats to come up with a wonderful piece of entertainment. Multiply the teams, and you get people in perpetual conversation with each other; games not only being inspired from other games in their genre, but crossovers, mashups, references, easter eggs, and more, all going back and forth. People being inspired by one another, and moving the genre forward: people using, bending, playing with a formal structure to create something new and entertaining. Considering music evolved from poetry—we've talked about the connection between hip hop and programming before here on Offworld— it's easy to see how code as poetry evolved as a type of conversation, artists (programmers) evolving the genre of their works based on conversations and exposure to others. One artist would influence other artists, and so on down the line. One-person development teams joined this conversation too, in their own way. Over time, the first three lines of renga became its own poetry form. You may know it as haiku: the three lines of 5-7-5 syllables each. Remember the haiku contest in Avatar: the Last Airbender? Haiku – and haiku contests – were like soloing in music. While haiku were shorter than the linked chains of poetry, they were an essential part and unit of poetry and many haiku poets were renga poets as well: since haiku could be done by one person, it was a chance to highlight one's own specialty and style. Haiku could be on anything, too; love, hate, the moon, relationships, the kitchen, a frog. Haiku could act as a diary of personal memories, or to preserve scenes you saw when traveling: Bashō was famous for this. Using the game analogy, one-person developers are the haiku poets of the games industry, something spun off into their own genre and not requiring as much collaboration, if any at all. Indie games that require teams? AAA games? Definitely renga. One-person shows? Haiku. Whether conversation, collaboration or solo projects, the art of game making is poetic, and open to all. To get an idea of what English-language haiku and renga sound like, check out the #haiku and #renga hashtags on Twitter and try your hand at them. Or you can try to create your own game using tools like Twine, or check out games and developers exploring travel, memory, and many other subjects in the #altgames tag.